Used by our distant ancestors, the bow-drill is made up of three parts: a sharp straight stick, a flat stone, and a bow. The stick was placed upright with the sharp end facing down and the stone rested atop. The bow was twisted over the stick to create a mechanism where the ‘sawing’ of the bow back and forth twisted the stick – causing it to drill into a surface. The gimlet was a metal rod flayed on one end and with a twisted sharp pattern cut onto the other. The user would hold the drilling rod in position and, while applying pressure, twist the drill like they were shutting a vintage bath faucet. Another popular hand drill was the eggbeater drill, which was one of the first drills to utilise a gear mechanism to rotate the drill bit. This is the drill most of us know and have seen in action before. The rotating gear-driven mechanism of the eggbeater drill was perfected and electrified over the years, culminating in a drill that can be plugged into any wall socket and make holes much faster than any hand drill. Unfortunately, you won’t be drilling anything when the power’s out. 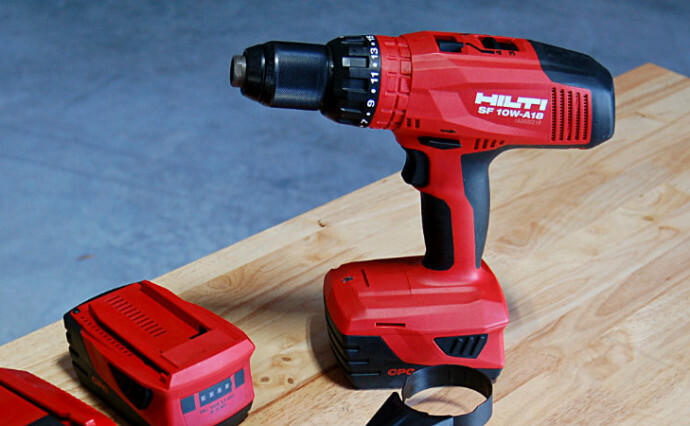 To solve that problem, the next logical step towards better drill mobility was to strap a battery pack to the corded drill – making it a cordless drill. While this is great for drilling in hard-to-reach spots and without having to drag an extension cable around, the cordless drills lose power as their batteries start to run out of charge – which is usually after 30 minutes or so of drilling. Used extensively in the construction industries to shatter through concrete and similar rock-hard surfaces, rotary hammer drills use both rotation and hammer-action to get the job done. Two separate motors rotate and shift the drill bit back and forth while drilling – making much more noise, but plowing through materials like brick and stone like nobody’s business! This is the removable point of the drill. The part that rotates and physically removes material from the drilling surface to create a hole. This is the part that the drill bit is fastened into. The chuck is retractable, so as to accommodate for various drill bit sizes, and is fastened and loostened using a chuck key. This switch sets the drill to either rotate clockwise, or in reverse (anti-clockwise). This can be used to release a stuck drill bit, or to fasten and loosen screws using screwdriver drill bits. This is the button pressed to activate the motor and start the drilling process. Some drills have pressure-sensitive triggers so as to better control the speed of rotation. This is a numbered ring that sets the ‘power’ of the drill motor. If you’re drilling into softer surfaces, you can set the torque down to a lower number. For harder surfaces, choose higher torque. These are located randomly upon the casing of your drill, but are by no means unimportant. This is where the fresh air gets in to cool down your drill’s motor. The chuck is loostened using the chuck key, and the drill bit is inserted with the sharp end facing outwards. The chuck is then fastened using the chuck key, keeping the drill bit straight as it is tightened into place. The chuck key is then removed. The forward/reverse switch is set to either clockwise (for drilling a hole) or anti-clockwise (for removing a screw). 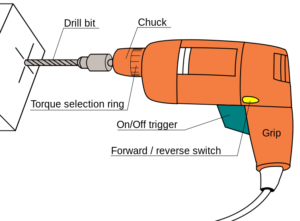 Once the drill bit is fastened and the direction has been set, the drill can be plugged into a wall socket and switched on. Hold the drill safely and give the trigger a quick press to ensure it’s operational. With your finger off of the trigger, position the drill bit on the point you’ll be drilling, keeping in mind the degree of your drill path (use a spirit level to help with this). Tighten up your muscles, hold the drill steady, and slowly squeeze the drill’s trigger. Once the motor kicks in, keep the drill as motionless as possible and apply pressure from behind. Don’t drill for longer than 15 – 20 seconds continuously. Need-A-Tool has a range of drills for rent, and a catalogue of drilling equipment for hire too. We stock only the best brands in the business, which include Makita, Bosch, Hilti and DeWalt. Contact us today to secure a drill rental for your next project!